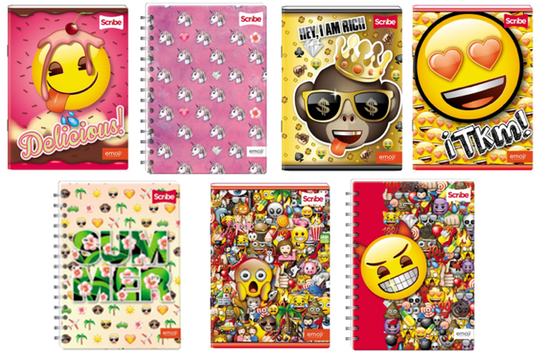 emoji ® – The Iconic Brand have teamed up with the market leader Scribe for a partnership on notebooks for Mexico, Central América and Colombia. Scribe notebooks are the perfect tool for school and working days and are produced of the highest quality. “We are happy to team up with Scribe who is the leader in its category that for more than 50 years. Scribe creates notebooks of the best quality for children and young adults.” says Marco Hüsges, CEO of the emoji company. Since 2015 Scribe uses a sustainable model that allows the firm to reprocess the paper which makes Scribe an eco-friendly company and a great partner for the emoji® brand”, so Hüsges. The product line already includes more than 50 different notebooks with cool designs and gadgets such as emoji® stickers. In Mexico products are sold at retail stores such as Office Max, Office Depot, Wal-Mart, Liverpool, Comercial Mexicana, Chedraui amongst others. In Central American market products are available at Wal- Mart, Office Depot, Artemis, Hispamer, Aranda amongst other channels. In Colombia partners such as Éxito, Jumbo, La 14, Olímpica, Metro, Office Depot, Papyser carry the emoji® notebook series from Scribe.